Scores of you headed to Birmingham NEC to represent the college at the prestigious competition, which is designed by industry experts to celebrate and accelerate young talent. Sam Smith, who completed his apprenticeship last year, won a silver medal in sheet metalwork, while Alysia Goodwin competed in fitness training and Thomas Thompson was highly commended in the refrigeration category. 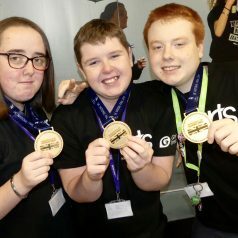 And learners Emma Densham, Lewis Drasdo and Hayden Brown won a gold medal for their work in the Inclusive Skills media competition. The trio, who were on a Level 1 Exploring Creative Arts and Media Sectors course at their time of entry, won a regional round in May before creating a Harry Potter and Fantastic Beasts themed podcast for the final. “The winners are usually from Level 3, so the fact we made it the final as Level 1 learners and then actually won is amazing,” they said. Prior to the big day, the team wrote a script and pre-recorded some of their lines and sound effects, which included a “comedy drum roll’. “We also had some jokes such as ‘how long does an owl live for? Six-and-a-half books!’,” joked Lewis. The group described the two hour wait for the results as “really nerve-wracking”, but said “it felt amazing” to win. Emma Forrest-Leigh, Associate Principal for Digital and Creative Industries, commented: “For the past three years we have held showcases at the NEC, with Worldskills core to our faculty vision. “This was our biggest and best year by far. We held three stands in VR technology, special effects, photography and TV skills with a 40 strong crew working their stands with the visiting public. “Alongside this we had our learners competing in the Media Inclusive finals. I’m so proud of Hayden, Lewis, and Emma for achieving gold, alongside our talented showcase crew for all being so confident and such great ambassadors for their subjects and for the college. Competing in the sheet metalwork category, Sam was tasked with making a pizza oven after reaching the National Skills final for the second consecutive year. In the build-up to the event, he returned to college after hours to seek help from former tutor Shaun Wing. 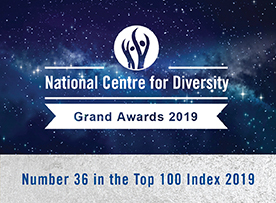 Sam’s employer, 4Matic Design and Manufacture Ltd, added: “This is a real top achievement by Sam, but Shaun has been incredible in his support of him. By working extra hours at the Institute, they both have made everybody proud.